Beautiful engraved certificate in nice condition from the Stammaktie uber 50 Wurste der Munchner, Germany . 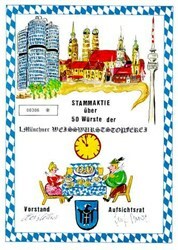 This colorful document has an image of old German Building with a man and woman eating at a dinner table. Founding share for 50 sausages, of the 1. Munich White Sausage Stuffers. probably a Carnival- or Octoberfest issue of an Munich"Fun" Club. This certificate looks terrific framed. This will make a nice addition to your collection or a great gift for someone special.